BeatsRx is a fitness music streaming service created by Sean “DJ Industrious” Antonius. Each mix features top Billboard hits methodically woven together to create a seamless workout experience that is exactly what the doctor ordered. All tracks are mixed by the BeatsRx team of DJ’s to deliver the new standard in workout mixes. Finally, something better! Sign up to start streaming BeatsRx mixes during your next workout FREE for your first 30 days. 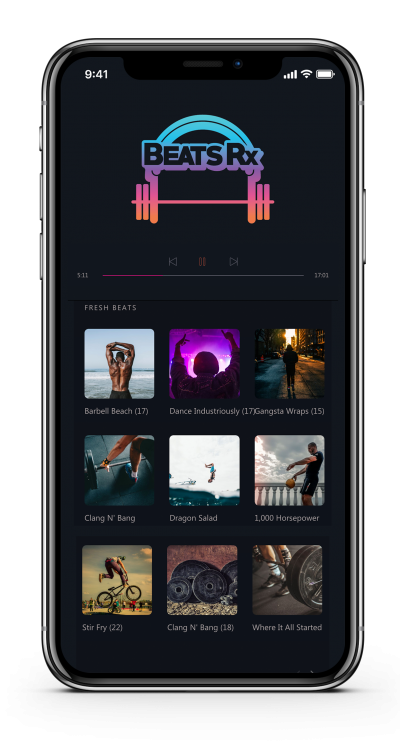 Stephen Hitt, the founder of Industrious (a wildly popular CrossFit Affiliate in Seattle Washington) found himself increasingly frustrated that he couldn’t find a music streaming service that didn’t disrupt the energy in his gym. Pauses between song changes, slow tempos, and lame tracks were killing the buzz. That all changed when a local DJ, Sean Antonius, came in and bought a membership at Stephen’s gym. Stephen explained his frustrations to Sean and the two went to work at creating a music experience that was designed to match the fun and intensity of the workouts at Industrious. It didn’t take long before people started asking, “How can we buy this music?” and BeatsRx was born. Its mission is simple, to bring the world together through fitness and music. We’re confident you’ll love BeatsRx, but don’t take our word for it. Try for free before you buy! At BeatsRX, we are here to help as a resource for ensuring you are properly licensed to play music in your facility…so you have peace of mind as a gym owner. If you are operating a fitness facility, and you are playing music through speakers in your facility, you need to have the proper license to legally do it. This means ANY music, regardless of whether it is off a streaming music service like BeatsRX, Spotify or off a tape cassette…if it’s pumping through speakers, you need to be licensed to play it through speakers. If you’re playing music through speakers in a commercial facility you need the right license. This license, takes a few minutes to set up right online and it is incredibly cheap relative to the value it brings to your business. You can set up your license with the American Society of Composers, Authors, and Publishers. Do the right thing…snag the license, pay the artists, for the value they bring to your business each day and Rock On! © 2019 BeatsRX. All Rights Reserved.